My garden is, for the most part, not really producing much again this year, even though I’ve conquered the slugs and the aphids and the cabbage worms and the thrips and all their various friends. I think partly the problem is that I put things in a bit too late, or in some cases, a bit too small. Another part of the problem is that I developed some bad habits last year, in my attempt to solve the problems I believed were plaguing my garden when the problem was, in fact, slugs. For example, I had cut back on the amount of watering I was doing, in the mistaken belief that the mysterious problem in my garden was overwatering. This year, my strawberries started doing really well when I started watering them – sadly, a bit late in the season to get maximum enjoyment from our fresh strawberries. Still, The Child makes regular visits to the backyard and returns with a handful of bright red berries that she swears are the most delicious berries she’s ever eaten. I’ll have to take her word for it. I’ve never gotten out there fast enough to get one before she does. I planted the strawberries in their own special area, a spot that is suddenly sunny following the removal of two small trees that previously resided there. The berries are mostly for The Child, whose school nickname is Strawberry Girl. Alongside them, I planted rhubarb, mostly for me. I don’t have a rhubarb-related nickname, but I do love the stuff, and have fond memories of my grandma’s rhubarb plants and, mostly, her rhubarb pies. The rhubarb grew like crazy: huge green stalks emerged only a month after I put the plant in, and though all the advice I found on the internet said not to pick rhubarb the first year you put the plant in, I realized that this was the same internet that told me I was overwatering when, in fact, I had slugs. So, I researched a little harder, and asked different questions, and finally came to the conclusion that when a rhubarb plant is producing this much, it’s quite alright to pick some. So I waited for the rhubarb to turn its familiar red hue. The rhubarb continued to grow – vast, leafy, green stalks. Stalks that never turned red. I finally caught a glimpse of a bit of pink at the base of one stalk, and got all excited, and … nothing happened. I googled some more and learned a fun fact: Not all rhubarb is red. Green rhubarb, which is apparently what I planted – I should really stop reading the internet and start reading labels – isn’t very pretty, but it is crazy delicious, and I decided to resolve the prettiness issue by simply marrying rhubarb with its traditional partner, strawberries. Since all our strawberries are consumed as soon as they ripen, I bought a bag of frozen strawberries from Trader Joe’s, found a recipe for jam, and then broke open my three-year-old, never-used, Learn To Can At Home kit. 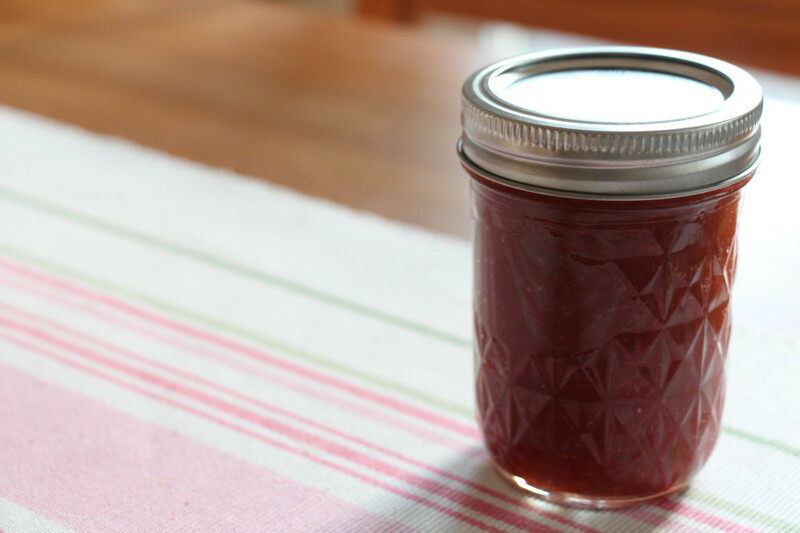 The jam recipe I chose was from Saveur magazine, and very easy to make and follow. I appreciate that I didn’t have to add any pectin, and the fruit cooked down and jelled just fine. The hardest part was not eating it all right out of the pot, because it’s so delicious that it’s hard to restrain yourself. It is all perfectly tart from the rhubarb, and perfectly sweet from the strawberries and sugar. The Child pronounced it fantastic. As satisfying as the jam is – even using frozen strawberries! – there was an even more satisfying moment in making it. I took the jars out of the water bath and set them on a towel to cool as instructed, and moments later, heard the snap of a jar sealing itself, and then another, and then another. I made jam for the first time, I canned something for the first time, and I did it all correctly because it worked. Even with green rhubarb and freezer-case strawberries.